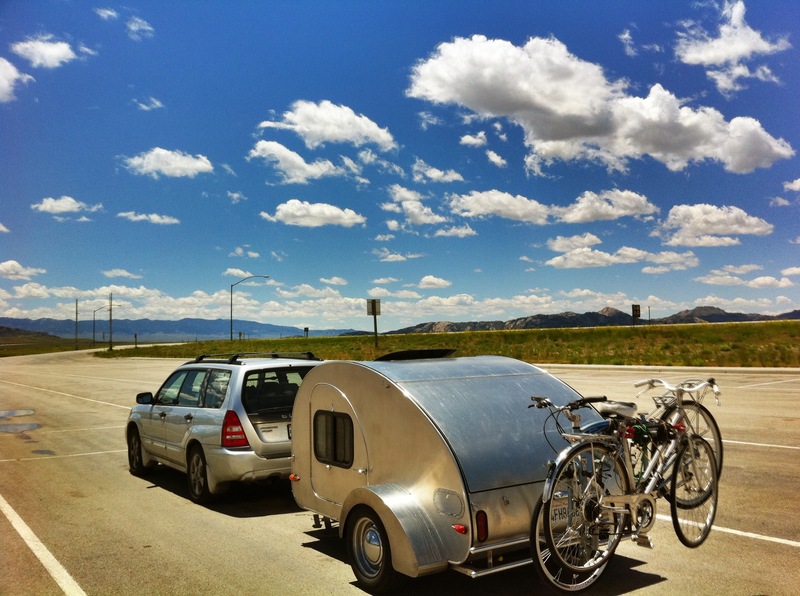 teardroptravelin' | Ride along on our "Lap Around America"! After a very quiet Winnemucca night, we stowed our worldly belongings in the teardrop one last time and, after brief stops at two strategically placed thrift shops, were wending our way westward. We continued across wide expanses of desert, sometimes brownish but mostly greenish like yesterday. The skies were blue and the headwind we had encountered yesterday was absent. In Lovelock we took a break and Diana did find one small thrift shop which she said had a lot of what appeared to be close-out merchandise from failed stores, but no unique treasures. We got back on I-80, and after a few miles I caught sight of a red light in my mirror. Soon afterward a Nevada Highway Patrol unit flashed by us like we were standing still. Then an ambulance passed us. Then another. We were both expecting to see a nasty collision ahead, but as we kept driving we didn’t see anything. Then ahead and to the southwest we began seeing a column of smoke, dark at first, then lighter, but continuing to to rise. There were railroad tracks running parallel to us and a few miles to the south. In the distance we began to see what looked like a stopped train surrounded by flashing lights. As we approached the turn-off for I-95, we saw signs warning that I-95 was closed to the south. The rest stop at the turnoff was filled with emergency vehicles — it looked like a staging area. Diana tried to see what was happening with our binoculars, but it was far enough away that it was difficult to tell because of the distance. It wasn’t until much later that we saw the news reports and realized that we had witnessed the aftermath of the truck/passenger train collision which resulted in at least six fatalities. We’re sad that our final day on this trip would have us encounter such a tragedy. In due time we we reached Reno. We stopped for gas at Costco (the first time we had done that since Frederick, MD) and Diana made the now obligatory pilgrimages to a couple of antique stores. 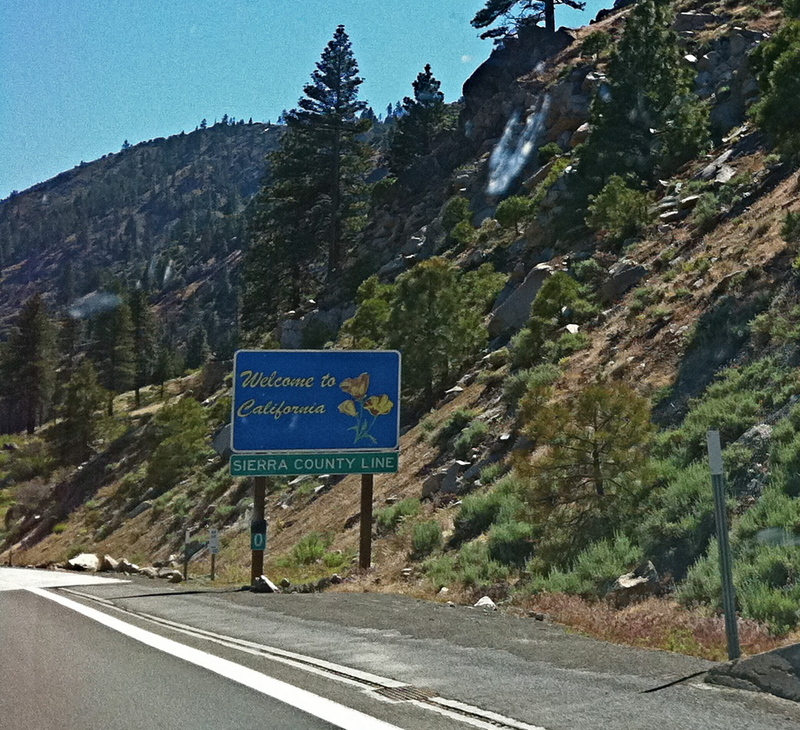 Then we jumped back on the highway, climbed up the Sierras, gave a nod to Donner Summit, and zoomed down the other side to Citrus Heights and our home. After stashing the teardrop and our Subaru in the garage, we walked into our house and discovered that Corrine, our wonderful next-door-neighbor had filled our fridge with fresh veggies and ranch dressing to dip them in along with a supply of her patented can’t-be-beat deviled eggs, and a lovely bowl of fresh fruit salad as well. We did a good job of making all that delicious food disappear. Thanks Corrine! According to our GPS, we covered 10,188 miles exactly since we started driving in April. We started this trip hoping to see new parts of America (to us) and we did. We hoped for adventure, we had that. We were looking to connect with ancestors and learn more about them, we have. We hoped to enjoy the company of family along the way, our hopes were fulfilled. We wanted to make new friends and they were out there waiting for us. And we promised to put some of those places, adventures, and people in this blog for you to enjoy. We hope you did. We celebrated or 43rd anniversary on this trip, and the last three months have enriched our relationship and given us many wonderful new memories to savor. That’s what traveling is all about, and that is the best part of all! Back in the Golden State once more! We were up and on our way by 10:00 a.m. and enjoying the clear day. We drove around Salt Lake and the Salt Flats, stopping at the rest stop near the Bonneville Salt Flats measured mile where land speed records are set. 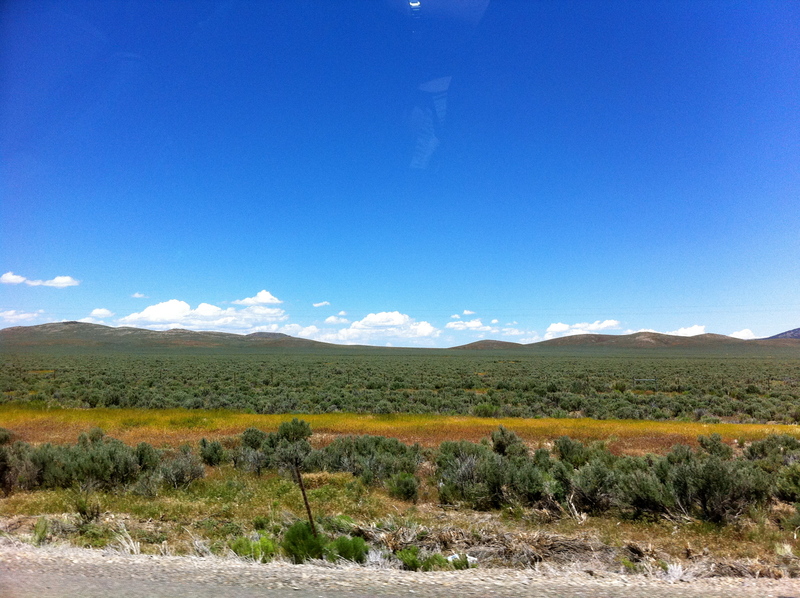 We paused at Wendover, Wells, Elko, Battle Mountain and ended up at Winnemucca. The desert was amazing. Instead of the usual brown and dusty vistas, we enjoyed green and yellow views over the miles. The sagebrush was lush. So was the manzanita. The main dominant color on all sides was green. I’ve been through this area many times and never seen it this way. The spicy aroma of sage assaulted our senses and the splashes of yellow Black Eyed Susan’s and mustard contrasted with the varying shades of verdant green on all sides. We found a place to stay in Winnemucca, with a complete kitchen, grabbed some food at a nearby Raley’s Super Store, and got ready to spend possibly our last night on our Lap Around America. The sky was beautiful at sunset, the flying saucer shaped clouds gradually turned pink, orange and gray as the sun set. You can’t beat the crystal clear desert skies for delivering sensational sunsets. We will probably make it home tomorrow. The end of a trip which introduced us to places we’d never seen, places we’d only heard about, and surprises along the way. But wait, there’s more — who know what tomorrow may bring? I’m pretty sure what tomorrow will bring. My husband got the bit in his teeth in Wyoming. We have been moving fast ever since. I can’t complain because Steve lets me check out any thrift stores I see. It is an educational experience to see the stores–where they are and aren’t. We have been through many towns which can’t support anything, even a thrift store. The 2011 Nevada desert - green is in style! After a restful night in Little America, we loaded up and jumped back on I-80. We stopped in Evanston in search of thrift or antique shops, but in vain. We continued on into Utah and over to Park City in hopes that we could find the antiques stores we remembered enjoying there. The locals we talked to said the one really good store had closed. We stuck around town long enough to grab a snack, and then pressed on to Salt Lake City. Here Diana did get to inspect the merchandise at a couple of larger thrift shops but didn’t find anything that interested her. Then we headed to “The King’s English” a bookstore of some renown. Diana can carry on from here. I read the book by the same title as the store a few years ago. For book lovers the book gives a lot of insight into the independent book sellers dilemma. The book store owner tells stories about the cutthroat business that makes “You’ve Got Mail” a lot more real. I remember once when she had to have a restraining order to keep B & N spies to keep from coming into the store to get her inventory info. Since she and her literati employees do lots of reading to select the best books, it is obvious that the big book stores wanted to take shortcuts. I also remember her examples of big book stores taking Salman Rushdie’s books off shelves while independent book stores put them in the windows. This was during the time when the extremist muslims put out a hit on the author. Obviously the story was used as an example of why independent book stores are so important to free speech. The book store is just as good as promised. I strongly suggest that any readers who go through SLC visit the store. While we were there a local children’s author, Dean Hale and his wife, Newbury Award Winning author Shannon Hale, were there to introduce his new book “Scapegoat: The story of a goat named Oat and a chewed-up coat.” They brought along a very cute black and white goat. Of course, there were many children and parents present to hear him read his book and meet him. “The King’s English” has authors, including Pulitzer winners, making personal appearances constantly! Authors support the store because the store supports authors–even new ones. The King’s English staff thoroughly review books. The store is like a jewelry box filled with inventory from Tiffany’s. Wherever we turned, Steve and I found great books. I only bought two. But I’ve got a lot on my wish list! I agree with Diana. The bookstore was chock full of books with people coming and going constantly. The staff was knowledgable, friendly, and truly interested in helping you select books you would enjoy. What a great place! After leaving The King’s English, we found our motel on the west side of SLC, and settled in for the night. Tomorrow we will wend our way to Wendover and points west. We enjoyed our night’s rest at the C’mon Inn and appreciated the complementary full breakfast. Afterward we spent some time enjoying the big Koi pond in the middle of the covered courtyard. We could get used to this! We reluctantly left our comfortable cocoon, and started on our way. We did fill up the gas tank at a nearby station at $3.35 9/10 a gallon! We also detoured into Casper so Diana could peruse a couple of thrift shops. She found a few small items to her taste. Today was a beautiful Wyoming day with a blustery wind and blue skies filled with puffy white clouds. With the prairie unusually green because of the strange weather this year, and washed with color from thousands of yellow wildflowers, driving through all that was a delicious experience and it was easy to spot antelope beside the road as we traveled along. We stopped at Independence Rock where wagon trains would also stop and rest on their way to California and Oregon. Diana and I had been here before, probably 20 years ago. Back then you could climb on the rock and read the names and dates scratched in the sandstone more than 100 years ago. Now it’s all fenced off and hard to get close to. Still, there’s a certain feeling you get looking at that rock and imagining all those hopeful people on that rigorous journey looking at the same rock. It makes you appreciate this country and the opportunities we have because of those brave, adventurous people. We drove on through Rawlins and Wamsutter, Rock Springs and Green River; towns with names very familiar to me because as a boy I lived here and traveled all these roads, lived in all those towns. Being here always brings back wonderful memories and actually makes me homesick, in a way. A nice way. 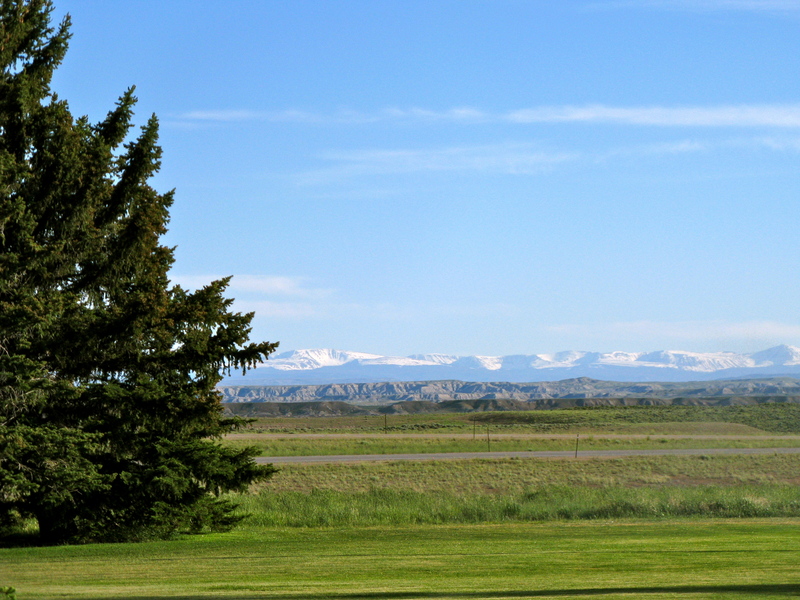 We stopped at Little America, an oasis in the middle of nowhere, got a room, had dinner, and enjoyed the magnificent view to the southeast of the snow covered Rockies. We may be on our the last few days of our trip, but we’re certainly still enjoying the ride and savoring every minute! Under Wyoming Skies at the Independence Rock rest stop. After a surprisingly quiet night in the Newcastle Fountain Motor Inn, we awoke to find that the skies were still gray, it was drizzling, and we needed to find someplace to provide us with breakfast. 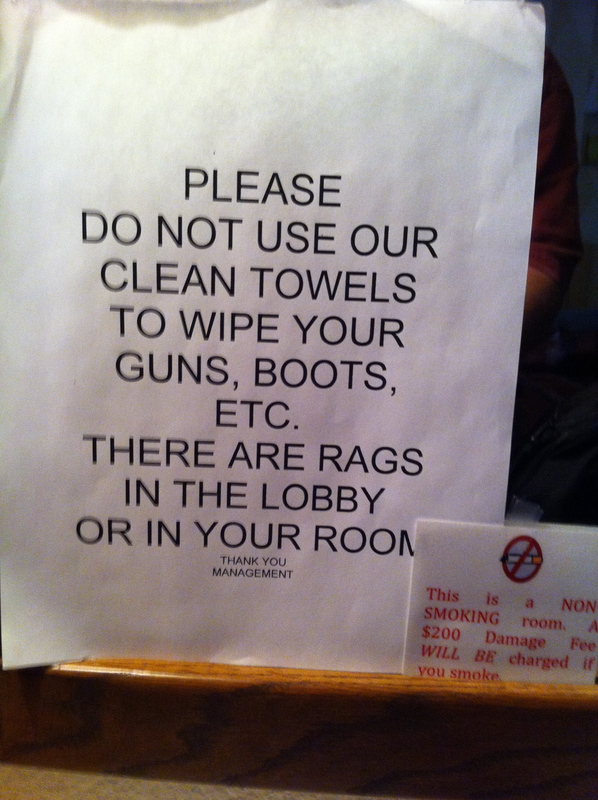 NOTE: This motel obviously caters to a slightly different clientele than the establishments we are accustomed to. Inside our room were several signs suggesting guidance about activities we had never considered. Such as: “DO NOT USE SINKS, TUBS OR TOILET FOR TRASH (or other inappropriate items)”. Ponder the possibilities for misconstruing that statement. I shudder to think. One sign provided a masterful example of stating the obvious, although perhaps not necessarily for the intended audience: “PLEASE PUT THE SHOWER CURTAIN INSIDE OF THE TUB WHEN YOU SHOWER SO THAT THE WATER DOESN’T RUN OUT ON THE FLOOR.” Makes sense to us. There was also a third, computer printed sign scotch taped to the mirror above the desk. Its message was so bizarre and unexpected that I took a picture of it. See for yourself at the bottom of this message. We left our “instructional” motel and drove to downtown Newcastle for breakfast at Donna’s Diner. The place was packed, but we found a table in back and enjoyed a very basic but tasty meal. The helpings were generous and the price was reasonable. Then, while Diana investigated the local antique shops, I took a rivet which had broken off one of our folding camp chairs and tried to find something to replace it at the local hardware store. Though the store was small, it was very well stocked and after sorting through many little drawers of nuts and bolts, I bought bolts, washers and wing nuts I hope will work. I’ll report later on the success or failure of my repair job. We punched Evanston, WY into the GPS and began driving down Highway 85. At Lusk we turned west, drove through Douglas (home to the Wyoming state fair), and on to Casper, a large and bustling oil town in the center of the state. Diana did a little more thrift shopping while I made a room reservation at a quaint motel called “C’mon Inn” we had seen on the outskirts of town. Then we drove to the location of another thrift shop downtown, but Diana couldn’t find anything at the address. Meanwhile, I had gone to the huge Wells Fargo Bank across the street to get some cash with my new temporary ATM card. It didn’t work, and the machine told me I was using an incorrect PIN number. I walked inside the bank to ask for assistance and was directed to the “Personal Banker” section. There were two PB’s there, both with customers, so I put my name in the book and sat down. 18 minutes later the two PB’s were still chatting away with the same customers without any signs of finishing anytime soon. No one else in the bank seemed capable of assisting me. When Diana finally came in to see what was keeping me we made a mutual decision to leave. What a different experience from the bank in Sheboygan! Diana and I decided to treat ourselves to dinner at the Olive Garden, and after a delicious meal we retired to our room for rest and relaxation. Tomorrow we shall attempt to complete our Wyoming crossing. We slept well in a very quiet campground even though the night wind whistled in our windows and even nudged the trailer a bit. We awoke earlier than usual, possibly due to changing time zones again yesterday. We are now on Mountain time, only an hour ahead of home. After coffee and breakfast we stowed our gear and readied the trailer for travel. Then we left the teardrop in camp and drove back a few miles to places in the park which were restricted to cars only. We hiked around the unusual formations and marveled over the bizarre shapes and subtle colors. This place really does look like it was designed by Disney Imagineers. We returned to camp, said goodbye to our fellow teardroppers, bid auf wiedersehen to our German neighbors, and drove away. The weather today is very threatening with dark clouds in every direction. The further west we drove, the darker the clouds became, and the scattered raindrops became a steady rainfall by the time we reached the outskirts of Rapid City. We turned off I-90 and stopped near a motel so I could enjoy a Father’s Day conversation with my son, Kit. Instead of just a simple phone call, we tried out Apple’s “FaceTime” feature on his iPad 2 and my iPhone 4. With wi-fi “liberated” from the nearby motel we were able to see and hear each other quite clearly. It was nice to see and talk to my son — it really made my day special! After “FaceTime,” we followed highway 16 as it climbed steadily into the Black Hills. 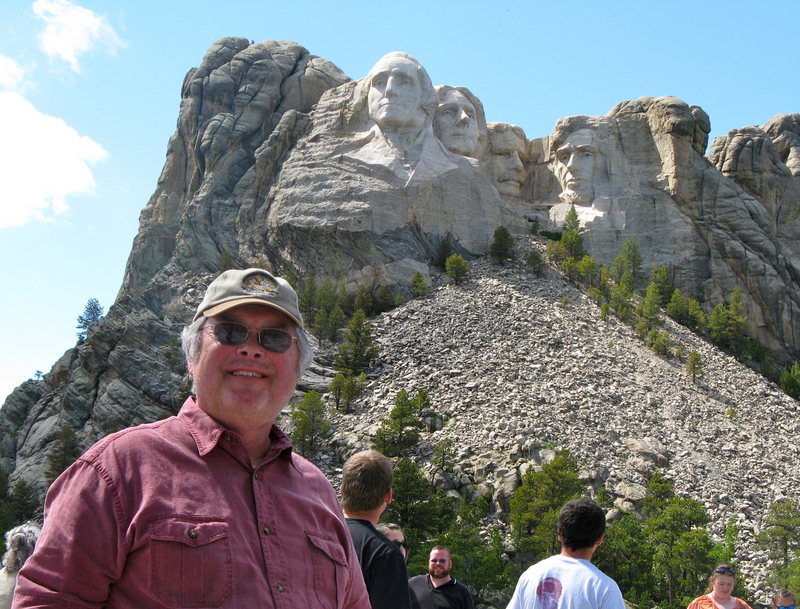 We passed through a very commercialized and touristy Keystone, and entered the Mount Rushmore concession parking area. $11.00 seems a bit steep to park at a National Memorial but that’s just the way things are. We hiked from our distant parking place toward the huge statues, and as we grew closer we marveled over the detail and quality of the sculpture. We snapped some pictures, fought the crowds and ate lunch in the restaurant with a perfect view of the mountain. Then we hiked up to the base of the mountain and listened to a ranger talk about the construction and history of the site. Amazing that more than 400 workers created it under very hazardous conditions, and yet no one was killed or even suffered serious injury. The mountain is estimated to be eroding at the rate of about one inch every 10,000 years, so their workmanship will be around for quite a while. We returned to our car with the sun shining brightly. As we sat in the car, our German friends parked across the street from us. We both had a good laugh over the coincidence. We had considered staying at Keystone for the night, but didn’t like the commercial feeling of the town, so we decided to continue west. Early evening found us crossing over into Wyoming and rolling into the town of Newcastle, about five miles into the state. This is a town which experienced an oil boom in the 20th century but is now a bit past its prime. We drove through town looking for a place to stay. There were a couple of commercial “campgrounds,” if you can call them that, perched next to the road with no trees or effort to conceal their location. We also hadn’t really seen any worthy motels, but finally decided to stay at the Fountain Motor Inn. It looked like we were among the very few tourists staying here. Most of the rooms are filled by oil workers with their trucks and equipment parked in a large lot alongside the motel. The workers themselves sat outside their non-smoking rooms and smoked like chimneys while talking with their colleagues. Oh, and there was a large pond with several substantial fountains. It looked to us like someone had big plans and then ran out of the wherewithal to complete them. It was a grand gesture though. The weather has stayed dry since we left South Dakota, but the sky to the north, south and west was almost pitch black and really kind of scary. The weather channel talked about tornado warnings in northern Colorado and western Nebraska — just where we are seeing that foreboding blackness. So far it isn’t headed our way. Almost everything in town was closed by the time we got there, so we purchased some snacks at the Dollar Store and settled down for the night in the wilds of Wyoming. I go to sleep tonight thankful for a safe day’s journey, some interesting things to see and do, and most of all for the love of my family. Life truly is good! After a satisfactory night at a down-at-the-heels Rodeway Inn, we breakfasted at “The Frying Pan,” a coffee shop right in front of the motel. The food was good, and we were stunned when the “sticky roll” Diana ordered was almost as big as a dinner plate. The waitress had warned us, so we had asked for a box right away and we took most of it with us for future enjoyment. Also in front of the motel was a BP gas station with the lowest price for gas we have seen on the entire trip: $3.39 9/10 a gallon! Needless to say, the tank was full to the top when we drove away. About an hour later we stopped at Mitchell to see the “Only Corn Palace in the World,” as it is proudly named. It is a large, squarish building with bunches of “Red Squarish” minarets and “onion skin” type domes festooned around the top. It is decorated annually with corn ears in a surprisingly detailed manner. This year’s theme appeared to celebrate the 125th anniversary of Wesleyan. It was… um, OK, but not worth driving all the way from Sioux Falls if that was your only reason for heading that way. The birds did seem to like the decorations, though. We continued west on I-90, and when we came to the Missouri River we stopped at a rest stop which commemorated the passage of the Lewis and Clark expedition. The boys stopped along the river here on the way west, and on their way back east two years later. It was a beautiful day and the view of the “Wide Missouri” was impressive. After a long day’s driving we arrived at Badlands National Park and drove to the visitor’s center. We found out from the ranger that the campground was not full, so we pulled in, picked a spot and set up housekeeping. We noticed another Camp Inn teardrop just a couple of campsites away from ours and walked over to meet our neighbors who have such excellent taste. Tom & Robin just picked up their trailer five days ago and are in the middle of a trip west. They are from Maryland. We had a nice chat with them and compared our two trailers. Theirs is #437, I think, and they have it well-equipped with not only a real DC fridge, but also an 85 watt solar collector to keep things charged up. Very cool! Also their good taste extends to the vehicle they are using to tow their new teardrop — a Forester! It’s a small world! Speaking of a small world, two gentlemen parked their shiny new motorhome next to our site and when I overheard them speaking German, I struck up a conversation. Turns out they flew in from Germany on Wednesday, picked up the new vehicle, and for a very reasonable rate they are transporting it to San Francisco. The rental company avoids an expensive transportation fee, and the tourists get a cut-rate deal on a nice camper. The men are from Cologne and I had fun polishing up my rusty language skills with them. 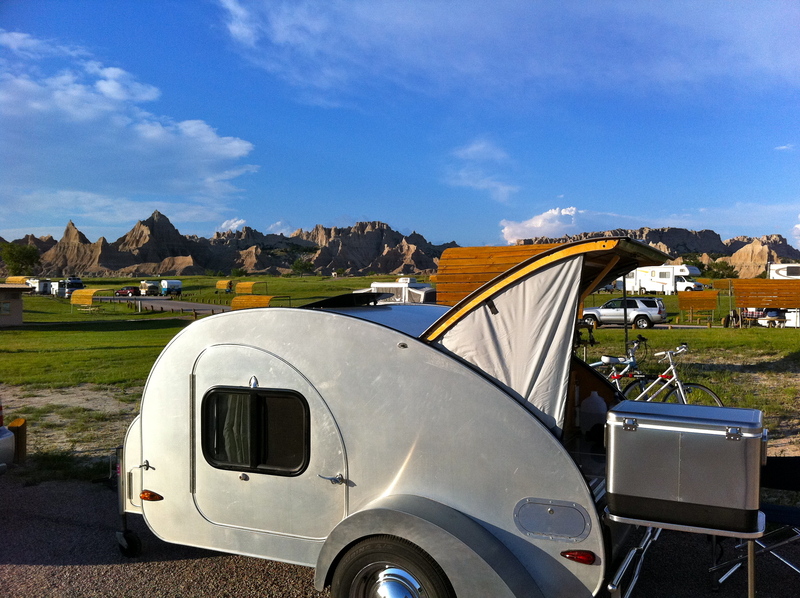 The stars were particularly bright before moonrise, and we went to sleep cozy and happy in our old/new teardrop.